Very new and clean hotel right next to downtown, convenient. This is not a new or fancy hotel but the bed was comfortable, the room was very clean and the breakfast to go was a nice touch. Where to find Yellowknife hotels near an airport? Where can I find hotels in Yellowknife that are near tourist attractions? Arranging a trip to Yellowknife? Looking for a comfortable place to stay? Just a short ride from Yellowknife's town center you'll find 11 Expedia-listed places to stay. 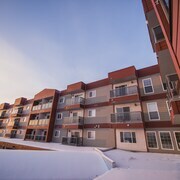 Those looking for a place to base themselves that is close to the center of Yellowknife won't find too many options other than the popular Capital Suites Yellowknife. the Prince of Wales Northern Heritage Centre and Northern Frontier Visitors Center each have accommodations nearby. The Explorer Hotel Yellowknife and Coast Fraser Tower Hotel are near the Prince of Wales Northern Heritage Centre, while the Days Inn and Suites Yellowknife and Arnica Inn are close to Northern Frontier Visitors Center. 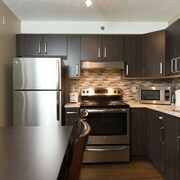 Accommodation options close to Yellowknife Veterans Memorial include the Capital Suites Yellowknife and Discovery Inn. 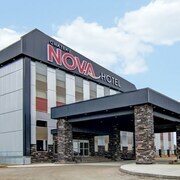 Hotels near the Northern Arts and Cultural Centre, include the Quality Inn & Suites Yellowknife and YELLOWKNIFE POLAR SUITE. 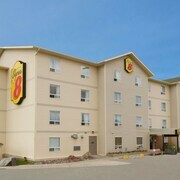 The Super 8 Yellowknife and the Stanton Suites Hotel Yellowknife are two Expedia-listed places that may match your requirements. 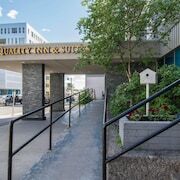 The Super 8 Yellowknife is 1 kilometre (1 mile) from downtown Yellowknife and the Stanton Suites Hotel Yellowknife is to be found 1 kilometre (1 mile) away. You can also enquire about booking a room at the Northern Lites Motel. 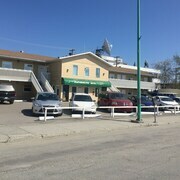 This Expedia-listed hotel can be found 0.8 kilometres (0.5 miles) from the middle of Yellowknife. Check out Expedia's up-to-date Yellowknife travel guide and learn about the terrific things to experience that this area offers. Life here is definitely a little rugged. Most locals make a living in the diamond mines. Of course, the famous lights of local aurora borealis displays create gems in the sky as priceless as diamonds. The Tibbitt to Contwoyto Winter Road makes Yellowknife one of the most important transportation hubs in Canada. Be on the lookout for the city’s legendary ice castles during a wintertime visit. Frozen, snowy winters turn Yellowknife into a city of glass from December until March. These months offer some of the most enchanted sky views. Transportation routes are diverted here to make use of the city’s ice road. Despite the cold weather, the area’s long growing season is spared from frost. The perpetual twilight experienced from May until early July attracts many travellers. Summer is bright and warm in this majestic corner of the world. The average summertime temperature here is around 17 degrees Celsius. Hotels in Yellowknife are full of adventurers looking for great snow sports or bejeweled skies all year long. Lace up your hiking boots to get this adventure started. Begin at Cameron River Falls Trail or Frame Lake Trail. Bring a touch of magic to your holiday at Aurora Village, Prince of Wales Northern Heritage Centre, and Old Town. Travelling to this kingdom of ice and lights doesn’t have to come with a royal price tag. Stay right here on Expedia.ca to grab discounts at hotels Yellowknife, Canada visitors prefer when they’re in town for a holiday. Enjoying a comfortable night’s rest is essential to planning a great vacation in this exhilarating destination. Plan to sleep in a luxurious setting with a little help from our exclusive vacation packages. We have the guaranteed best rates on hotels around. It only takes a minute to put together an all-inclusive deal featuring overnight accommodations and cheap flights to Yellowknife. Experience a sky full of stars using a sky full of savings from us here at Expedia when you book your trip today. What are the most popular Yellowknife hotels? 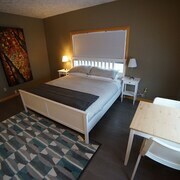 What other types of accommodations are available in Yellowknife? Explore Yellowknife with Expedia.ca’s Travel Guides to find the best flights, cars, holiday packages and more! Flights from Nashville Intl. to Pearson Intl. Flights from Schiphol to Pierre Elliott Trudeau Intl. Flights from Roissy Charles de Gaulle to Pierre Elliott Trudeau Intl. Flights from Victoria Intl. to Cancun Intl.